Shane Cotton, "Smashed Myth", 2010, acrylic on canvas, 300 x 190 cm. Courtesy: Anna Schwartz Gallery. Writers plagiarise themselves all the time, but they don’t always admit it. It’s tempting to do. Sometimes a sentence is just so good it deserves repetition (or so you think, enamoured by the sound of your own voice). And there are only so many ways you can say the same thing if you are writing your umpteenth piece on a topic. Appropriating your own words may be very post-modern, but it’s also a bit naughty if you don’t let the reader in on the secret. As all good uni students know, it’s not plagiarism if you move the sentences around a bit and acknowledge your sources! So consider yourselves warned, I’m about to quote myself. 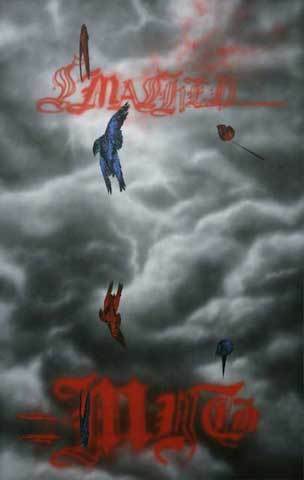 In 2007, I reviewed Red Shift by the New Zealand painter Shane Cotton. At the time, I loved the work so much I was totally devastated that I couldn’t afford the $10K (or was it $20K?) it would have cost to take one home. Ironically, when I visited Cotton’s latest solo show, Smashed Myth, I still really liked the work, but I couldn’t think of a single new thing to say. Here’s an edited version of what I said in 2007, and, strangely, it still seems to fit. 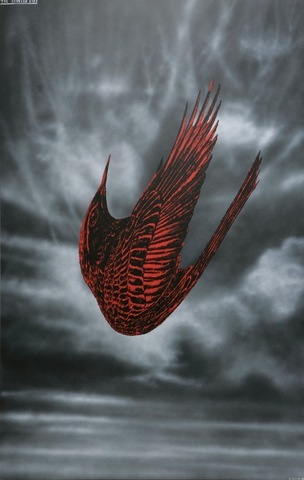 Shane Cotton, "The Painted Bird", 2010, acrylic on canvas, 300 x 190 cm. Courtesy: Anna Schwartz Gallery. Shane Cotton serves up a heady cocktail of medieval magic, tribal ritual and computer game aesthetics. His paintings could be a dark alternative universe glimpsed through a crystal ball, or a freeze framed screen-shot capturing the tweaked hyper-reality of digital fantasy. Painting may be a static art form, but Cotton’s canvases are a wild ride. Looking at his images is like experiencing the vertiginous rush of disembodied zooming through a virtual world. Stark black and white landscapes seem vaguely pixelated and blurred with speed. Cataclysmic storms smear the sky and rocky terrain seems to dip, tilt and fall away, then jerks to an abrupt halt. In Cotton’s world everything is frozen in mid flight. Time stops; suspended either by muttered incantation, or the technological magic of the pause button. Crystal clear, brightly coloured birds are caught in awkward poses as they are blown across a fuzzy monochromatic sky. They seem like bit-part players in a larger drama. As in ordinary life, the real action is happening off camera. Shane Cotton: Smashed Myth is on at Anna Schwartz Gallery until September 25, 2010.